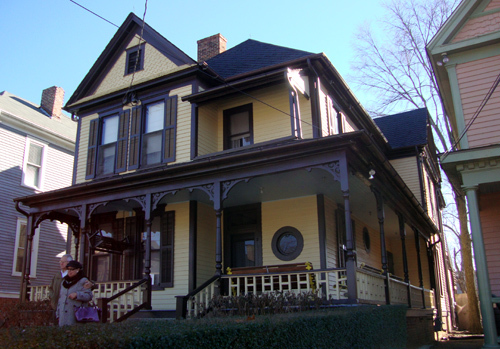 The Martin Luther King, Jr. National Historic Site was created by legislation signed by President Carter on October 10, 1980, and today is managed by the National Park Service. It stands as a living memorial to the world's greatest civil rights leader, the man responsible for leading the United States of America in changing its laws, increasing its tolerance, and strengthening its embrace on human rights. The MLK National Historic Site is a complex that includes King's birth home, museum exhibits chronicling his life's work, the church where he worshiped, and the tomb where he and his wife are laid to rest. I knew from web research that the King Center is free of charge, but to go on the guided tour of King’s birth home, I had to secure a timed ticket (also free). There are only 15 tickets available for each tour, and this close to the King holiday, I wanted to make sure I didn't wait until the last minute. Upon arrival, I immediately went to the Visitor Center where a Park Ranger of the National Park Service gave me a map. After telling me about the video and exhibits in the Visitor Center, she gave me directions to Freedom Hall (where one gets their timed tickets for the birth home tour), which is part of The King Center. I highly recommend getting a map before you begin exploring. 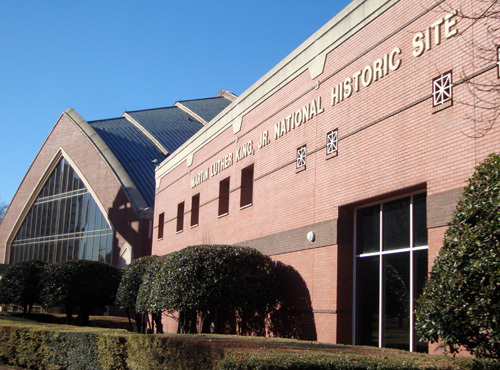 The King National Historic Site is several blocks long and wide, so you'll need the map to make sure you get where you want to go and to ensure you don't miss what you want to see. When I returned to the Visitor Center after exploring the birth home and other attractions, I sat for the 18-minute video which was about King's birth home. If on your visit, you don't manage to get a ticket for the home tour, the video is the next best thing. In the lobby of the Visitor Center is an interactive "Children of Courage" exhibit. It’s a learning station designed for children and it's hands-on…visiting kids are invited to touch, feel, discover and learn. 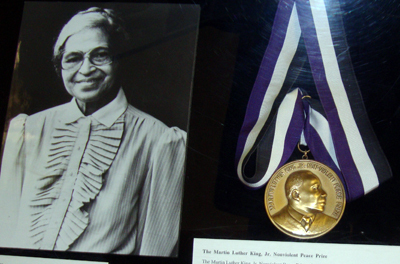 The Visitor Center also has an amazing exhibition, "Courage to Lead," filled with information in the form of videos, displays and artifacts telling of King's involvement in the civil rights movement throughout his life. 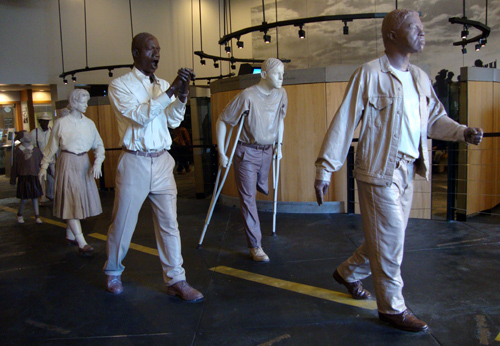 There’s also a life-size exhibit, "Freedom Road," which visitors can walk through, with models representing those who walked and marched for civil rights. This gallery also has the caisson that carried King's casket during his funeral procession. After getting the orientation at the Visitor Center, I headed to Freedom Hall to get a ticket for the birth home tour. The Park Ranger on duty was very kind and helpful. She took my name, told me that my ticket would be ready in 30 minutes, and told me about the three galleries within Freedom Hall. Since I had time before the birth home tour, I decided to check out the galleries in Freedom Hall before heading over to the birth home, which is only a short walk. The first of the three I went into was the Rosa Parks Room. The gallery, although modest in artifacts, except for the quilt that is the focal point in the room, commemorates King's role in the event Rosa is so well-known for. 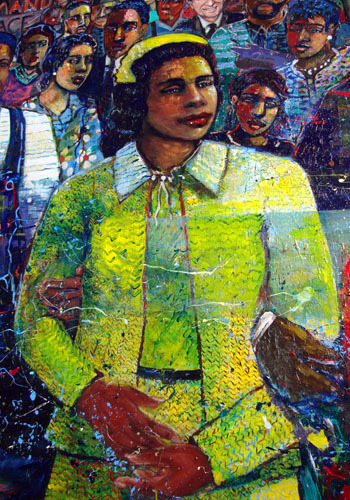 Rosa Parks, a resident of Montgomery, Alabama, was arrested for refusing to sit in the back of a bus. The person chosen to lead the organization that was to defend her and to organize a boycott of the bus company was none other than Martin Luther King, Jr.
Next, I was off to the Gandhi Room. Martin Luther traveled to India in 1957 where he met Prime Minister Jawaharlal Nehru and learned of Gandhi's teachings of non-violence. 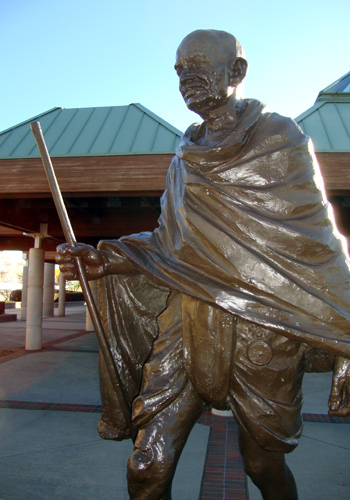 There also is a statue of Gandhi standing just outside the Visitor Center. King's devotion to achieving racial justice through non-violence is noted in his first book, Stride Toward Freedom. The third of the three galleries I visited in Freedom Hall was the Martin Luther King, Jr. and Coretta Scott King Room. This gallery has the largest collection of artifacts from King's life, save the birth home. 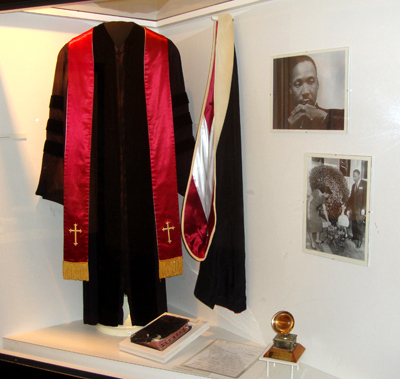 The collection includes garments worn by Martin Luther and Coretta, awards they received during their lifetimes, and Martin Luther’s personal Bible. While in the King gallery, I recalled having seen Coretta at the Fox Theatre many years ago. Her being in the theatre created a lot of buzz and excitement...for good reason. 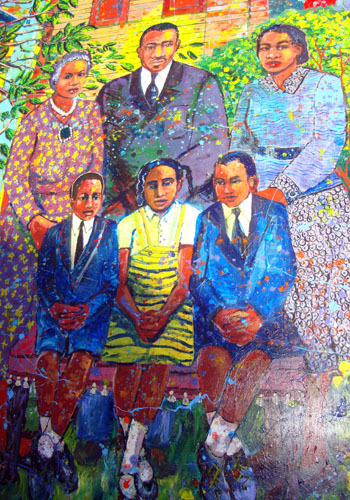 Following her husband's death, Coretta continued his work on many fronts. 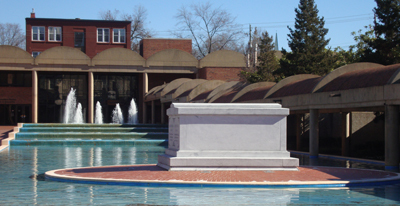 In the plaza just outside Freedom Hall is the tomb of Martin Luther King, Jr. (1929-1968) and Coretta Scott King (1927-2006). The King tomb is "floating" on an elongated reflecting pool. At the end closest to Freedom Hall is a four spout fountain and at the other end is the Chapel of All Faiths (which wasn't open when I was there). Immediately adjacent to the tomb is the Eternal Flame which symbolizes "…the continuing effort to realize Dr. King's ideals for the 'Beloved Community'…"
More than 1,000,000 people visit and tour the King Center every year. It was time for the scheduled tour of Martin Luther's birth home. I headed to the meeting point—the gift shop in the house next door to the birth home—where I met my fellow tourists (one was from Washington, DC, from where I just moved) and Doug, the Ranger who would lead our tour. I found it ironic that Doug is visually impaired. It made me wonder what the world would be like if humans could not distinguish skin color and what other wonderful things the man Martin Luther could have accomplished if not faced with the strive for human rights. Photographs are permitted everywhere within the Historic Site except for the birth home (at the request of the King Family). The tour is well worth the time (approximately 40 minutes)…not only to see a piece of history, but to see and hear about where one of this country's greatest leaders spent his formative years. King, and his siblings, was born in the house, on the second floor. The family lived there until Martin Luther was 12 years old. Doug gives a phenomenal tour! He was animated, extremely knowledgeable about King's early years, he engaged the kids as well as the adults, and posed a couple of thought-provoking questions along the way. On the tour you see the parlor where Martin Luther took piano lessons, the family room where he regularly won at playing Monopoly, the dining room where the family gathered every Sunday after church, the kitchen where he enjoyed his favorite breakfast cereal Wheaties, his sister's room, his grandmothers room where she read to the children, his parents room where he was born, and his room where he and his brother played, read and slept. The Historic Fire Station No. 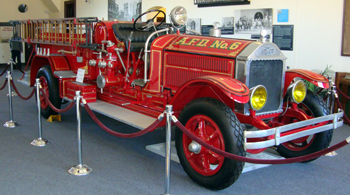 6 was instrumental in the racial integration of the Atlanta Fire Department. Build in 1894, Fire Station No. 6 is Atlanta's oldest standing firehouse. Today, the station stands as a museum and houses a 1927 fire engine, among other artifacts. The Fire Station is also managed by the National Park Service. The Historic Ebenezer Baptist Church (the "Heritage Sanctuary") is where Martin Luther's father preached and where he would later serve as Assistant Minister with his father. The Heritage Sanctuary is currently undergoing a substantial renovation. When completed, the church will again feature the style and décor it had when Martin Luther attended. The expected completion of the project is in 2011. 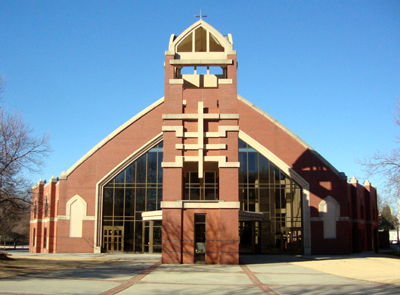 The "Horizon Sanctuary" is the modern Ebenezer Baptist Church, which was opened in 1999. Unveiled by Mrs. Coretta Scott King in January 1990, the statue "Behold" stands in front of the Horizon Sanctuary as a memorial to Dr. Martin Luther King, Jr.'s work and as an "inspiration to others to fight for dignity, social justice, and human rights." 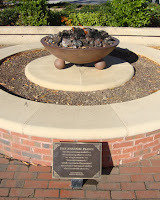 Peace Plaza runs the length of the front of Ebenezer Baptist Church (the Horizon Sanctuary) and the Visitor Center. Within its ranks are the statue Behold. Also on the plaza is an international rose garden peppered with "inspirational messages of peace" written by students in the Sweet Auburn community that reflect the ideals of Dr. King's work. Immediately outside the Visitor Center across the courtyard is a mural nearly as long as the Visitor Center is wide. The painting style varies and the colors are bright. The optimal time of day for photographs is mid- to late-afternoon (this time of year, at least). 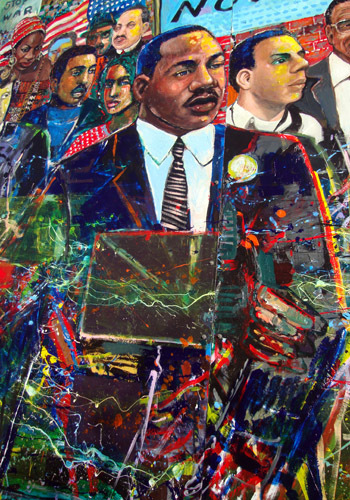 The mural depicts the life of Dr. Martin Luther King, Jr. from the time he was 10 years old until his final speech, which he gave in Memphis, Tennessee in 1968. 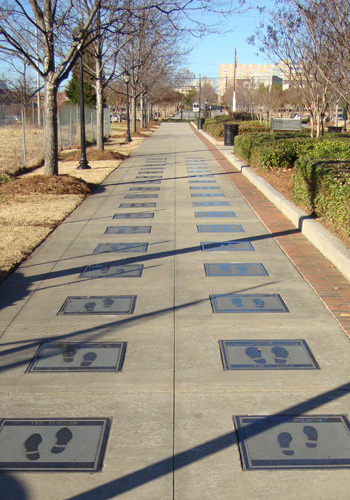 Leading to and from the Martin Luther King, Jr. National Historic Site is the "International Civil Right Walk of Fame," which depicts the footsteps of other leaders, living and dead, as "recognition to those courageous soldiers of justice who sacrificed and struggled to make equality a reality for all." The Walk of Fame is a partnership between the National Park Service and the Trumpet Awards Foundation, Inc. A few of the people who have been recognized with bronze and black granite footsteps include Rosa Parks, President Bill Clinton, Magic Johnson, Ted Turner, and Dr. Maya Angelou (who I've also had the distinct pleasure of hearing and meeting). Will I return to the site that honors one of Atlanta's most famous, influential, and charismatic citizens? You can count on it. I spent an afternoon at the Martin Luther King, Jr. National Historic Site and saw and learned only a fraction of what’s available… I want to know more about Martin Luther and how he shaped my country. Hours: Winter 9:00 a.m. – 5:00 p.m.; summer 9:00 a.m. – 6 p.m.